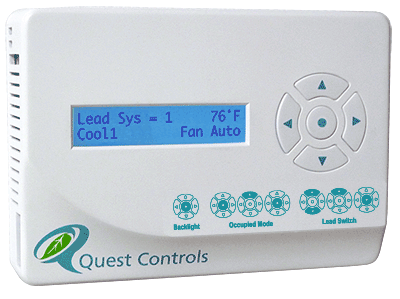 The Quest T-stat Lead/Lag Controller Model 101 is a smart control system designed to replace conventional Lead/Lag controllers that do not offer wide temperature control windows for advanced optimization of HVAC operation. The T-stat LLC controls two single stage HVAC systems to provide lead/lag operation with automatic switching based upon time. The system has a built in 2 line by 16 character display for status monitoring of the current temperature and operating mode of the HVAC equipment. Controls two single-stage HVAC systems for Fan, Cool and Heat. Power from both HVAC’s 24VAC transformers. Automatic lead change every 24 hours. LCD display for current operating mode and shelter temperature readings. Comfort mode to allow “Occupied” temperature settings for one hour. Five button keypad for navigation to other status screens. The setpoints are factory configured but changeable through password protected menus. Enclosure — Two piece thermal molded plastic enclosure. All wiring is done on the mounted base and the controller is pull-off.